I never procrastinate when mixing down audio recordings. Well, hardly ever. Okay, I guess I’m running 33% late. 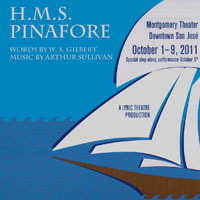 Anyway, I finally got around to finishing up the HMS Pinafore sitzprobe recording with Lyric Theatre. Being in rehearsal for The Pirates of Penzance might might have provoked me to get around to it. Links are below. If you want a CD, then ask me or try to find it at the warehouse somewhere.